For those of us who went to college in the past 10 years, we’ve had our fair share of wine in a box. Who can forget slap the bag? But wine in paper bottles and wine in cans? These are new and intriguing entries to the U.S. wine market. It’s made by a U.K company called GreenBottle and the eco-friendly company’s first U.S. partner is California-based Truett-Hurst. Inside this interesting container will be Paperboy, a 2012 red blend from Paso Robles. What’s in the blend doesn’t seem to be portrayed on the bottle, but it does clock in at 14.5% alcohol and it’s coming to a Safeway stores soon. 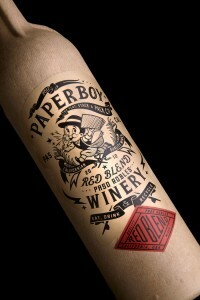 The paper bottle has already been used by Kingsland Wines on the other side of the pond. That winery used the label Thirsty Earth for its paper bottle wines, which included a New Zealand Sauvignon Blanc and an Australian Shiraz. Much like boxed wines, paper bottles are lined with a plastic bladder to hold the liquid. According to Fox News, you can put it in ice for up to three hours without the paper disintegrating. I feel like I need to test this out myself before believing that one. I don’t know how much it will cost, but once I figure that out, I’ll update. An Oregon winery has canned Pinot Noir and Pinot Gris in 8 ounce containers! 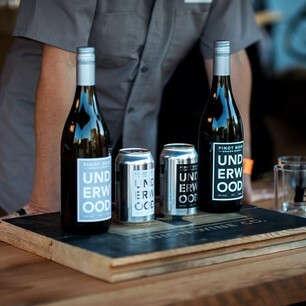 Union Wine Co., which cans the wine under the label Underwood, wanted to reverse the craft beer trend, where beer has been elevated out of Miller and Bud territory and into the world of tastings and fancy glasses, much like wine. It’s about taking the snobbery out of wine and making it more accessible, which seems to be the trend du jour. The cans even feature the Twitter hashtag #pinkiesdown. They’ll be available next year; $5 for an 8-ounce can.